Apply and enforce comprehensive provisions for fire and life safety with the Florida Fire Prevention Code, Sixth Edition 2017 based on NFPA 1: Fire Code and NFPA 101®: Life Safety Code®. Conduct fire and life safety inspections, install and test safety systems and equipment, and protect people and property with the Florida Fire Prevention Code, Fifth Edition 2017 based on NFPA 1, 2015 Edition and NFPA 101, 2015 Edition. To distinguish Florida changes, additions, deletions, and exceptions to the NFPA® codes, "FL" symbols appear in the margins of the documents. Essential for fire marshals, architects, engineers, building owners, and AHJs throughout the State of Florida. The Florida Fire Prevention Code is adopted by the State Fire Marshal at three year intervals as required by Chapter 633.202, Florida Statutes. This complex set of fire code provisions are enforced by the local fire official within each county, municipality, and special fire district in the state. The county, municipality or special district in which you reside may also have local amendments applicable only to your community. 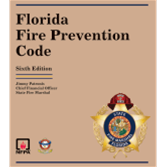 Interested in older editions of the Florida Fire Prevention Code? Use the drop down menu above to select it.